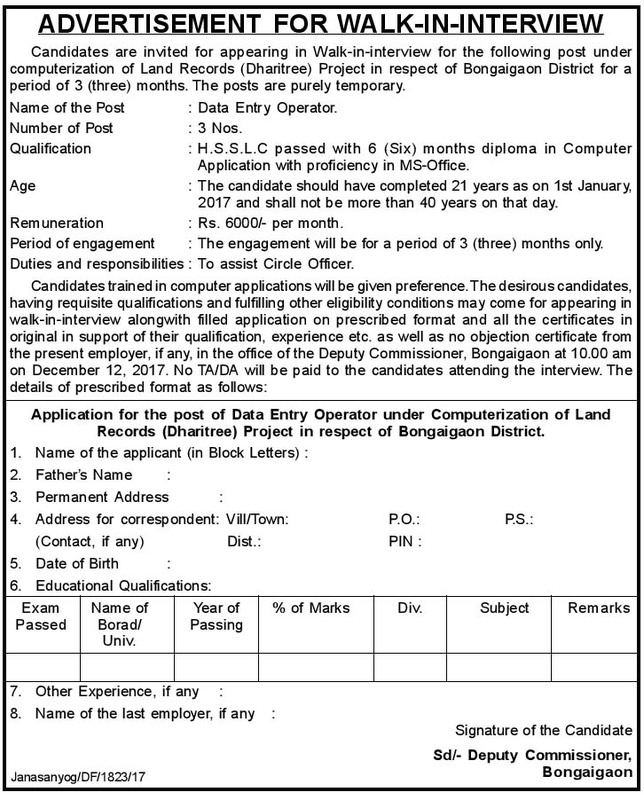 Candidates are invited for appearing in walk-in-interview for the following post under computerization of Land Records (Dharitree) Project in Respect of Bongaigaon District for a Period of 3 (three) months. The posts are purely temporary. Name of Post: Data Entry Operator. Qualification: H.S.S.L.C passed with 6 (six) months diploma in Computer Application with proficiency in MS-Office. Age: The candidate should have completed 21 years as on 1st January, 2017 and shall not be more than 40 years on that day. Period of engagement: The engagement will be for a period of 3 (three) months only. Duties and responsibilities: To assist Circle Officer. Candidates trained in computer applications will be given preference. The desirous candidates, having requisite qualifications and fulfilling other eligibility conditions may come for appearing in walk-in-interview alongwith filled application on prescribed format and all the certificates in original in support of their qualification, experience etc. as well as no objection certificate from the present employer, if any, in the office of the Deputy commissioner, Bongaigaon at 10.00 am on December 12, 2017. No TA/DA will be paid to the candidates attending in the interview. For more information and prescribed application form, candidates can download the official advertisement from below.